It's no secret that I love coconut. I can't get enough of it! I was thinking about how awesome it would be to have a bite-sized little coconut pie. I've seen recipes where people use sugar cookies as a mini crust. I was thinking of this late one night when I should have been sleeping. I had a batch of sugar cookie dough that I hadn't used sitting in my freezer. I know, that's weird. One day I was on a mission to make some cookie cut-outs but got distracted by another project, so into the freezer it went. Perfect. I popped it into the fridge to thaw when this idea struck me, and by the next afternoon it was ready to work with. This beautiful little cup is everything I imagined it would be and more. 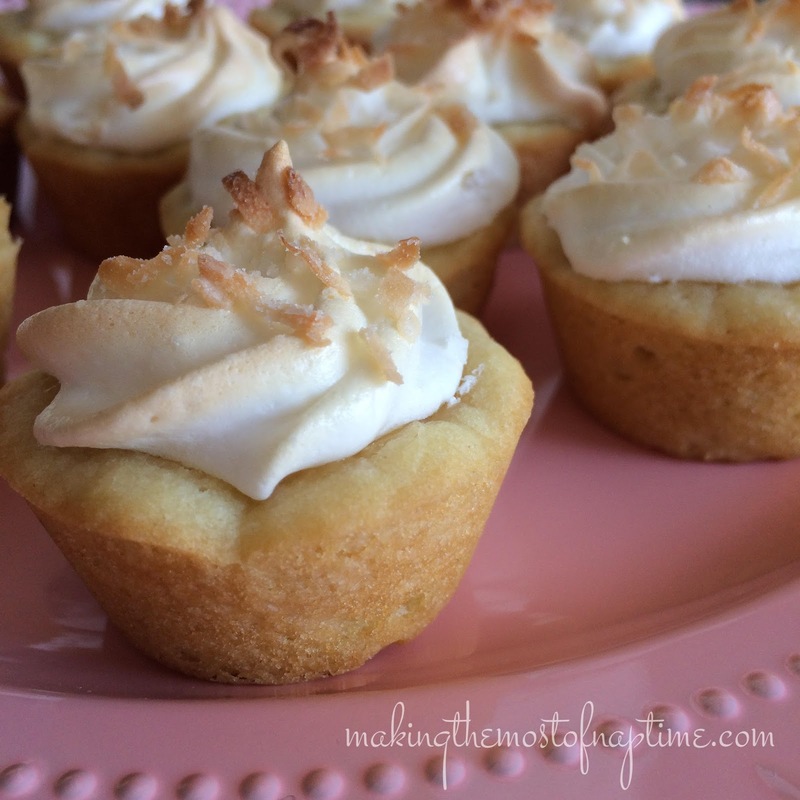 It is truly a bite-sized little coconut-cream-pie-sugar-cookie piece of perfection. 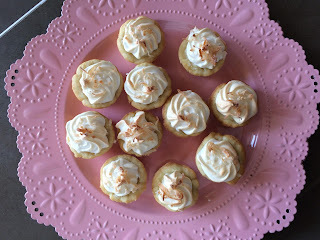 These would be a fantastic dessert for a spring brunch, or a baby or bridal shower. They're light and fluffy and look so pretty on display. They make a big batch of 48, so they're perfect for a crowd. This recipe is so much easier if you have a sufficient amount of mini muffin pans so you can do them all in one big batch. I have found several 24 capacity pans for well under $10. If you're cooking with the tiny 12 capacity pans, treat yourself to some nice big ones. You'll use them far more often than you think! I only recently acquired some bigger pans, and I really wish I had bought them years ago. -Combine flour, baking powder, soda, and salt in a small bowl. -Cream together butter and sugar until very light and fluffy. Add egg and extract and beat very well. -Gradually stir flour mixture into creamed mixture. The mixture should form a stiff dough. If it is crumbly, add a very small amount of milk until it is the desired consistency. -Split dough into two equal portions and wrap well in plastic wrap. Chill for 1.5 to 2 hours. -After chilling, roll the dough to 1/4 inch thickness on a lightly floured countertop (or on a piece of parchment). Using a 2.5 inch biscuit cutter (a 2.5 inch diameter glass works well too), cut the dough and carefully place the circles into non-stick mini-muffin tins, to form a cup. This recipe will make approximately 48 cookie cups (depending on how many muffin tins you have, you might need to make several batches). -Bake in a preheated 350F oven for 10 minutes (it will be slightly underdone). The dough will puff up slightly. When you remove it from the oven, use the handle of a wooden spoon to gently poke down the dough, which will solidify the little "cup" shape. Set aside. -Combine the sugar, cornstarch, salt and milk in a medium sized saucepan. Whisk and stir over medium high heat until thickened and bubbly. Reduce heat and continue to stir for a couple of minutes. -Remove the milk mixture from the heat, and stir a small amount (I added just a couple tablespoons) into the egg mixture. THIS IS VERY IMPORTANT! The purpose of this is to increase the temperature of the eggs, so that when they're added to the hot milk mixture they don't scramble. Keep adding a few tablespoons of the hot mixture to the eggs, stirring constantly, until the egg mixture is just warm. Then add all of the egg mixture into the hot milk mixture in the saucepan. Whisk quickly while doing so. Bring this all to a gentle boil and cook for about 2 minutes. It should be a silky smooth, thick texture. -Remove from heat and stir in the coconut, butter and vanilla extracts. Carefully fill each of the cookie cups. Set aside and make the meringue topping. Beat egg whites, cream of tartar and vanilla until soft peaks form. Add the sugar and continue until peaks stand on their own and are nice and glossy. Gently spoon or pipe onto each filled cookie cup. Sprinkle with coconut. Bake in a preheated 350F oven for between 12 to 15 minutes, or until golden brown. Allow tarts to cool slightly in the pan before very carefully removing each tart with your fingertips after loosening with a knife. Allow to fully cool on a wire rack and then refrigerate for at least 2 hours. Enjoy, and don't forget to check out Easter Week, below! This week, thirteen bloggers are sharing 46 recipes and tips to help you serve up deliciousness this Easter. Follow #EasterRecipes on social media to see what we're serving up! OH my....I could steal my hubby's heart all over again if I made a batch of these sweet little tarts. I just can't get enough coconut! Ever! I can't wait to make these beauties. I wish I had the time to make them this weekend... but I already have a menu twice the size it should be. Definitely soon though! I love coconut too! They look delicious with that sugar cookie base. They look so decadent!! I have to bake and take cause I'd eat the whole batch. I love bite sized desserts! There perfect for special occasions like Easter when everyone wants to "try" more than one dessert. 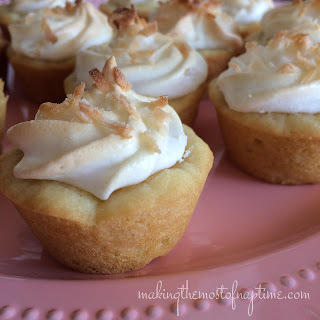 They are perfect bite sized creamy coconut tart... love coconut too. Nice presentation too, the tart looks good.